Your home is probably going to be the biggest investment of your life and maintaining it obviously your greatest responsibility. And if it is a residential property in New Jersey that you own, you can never afford to overlook it! If you have been looking for a company offering complete residential handyman services in NJ, HAYS NJ is here to finish your to-do list. We’re easily reachable at 732-360-7770, 201-335-7222 or 732-360-7770, you can call us for same day inspection and free quote anytime of the day or night – we even work on all holidays! When the list of major and complicated home repairs is too lengthy to handle, you can call trained professionals at HAYS NJ any time to help you. Since we have been handling repair and maintenance projects within residential properties for years now, you are sure to get the most professional, quality and personal handyman services. Our handyman services cover almost all your home repair service needs, including the most important home parts such as bathroom, kitchen, attics, garage and outdoor. 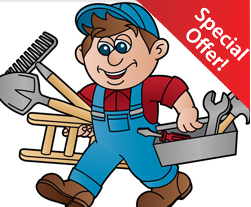 Make your list of residential handyman services that you need and contact us today! We’ll make sure you get the most appropriate solutions to all your repair needs and save both time and money. To get a free service quote today – call us at 732-360-7770, 201-335-7222. You can also ask for a quote online, our email address is customerservice@hays-nj.com.